Today's post is going to be the Christmas Tag. I love doing tags, especially christmassy ones of course! I think they're a great way of getting to know someone and they're so much fun to write anyway so I thought why not do this one today!! Ooooo that's a tough one! Of course I love ELF, I mean who doesn't!? I honestly watch it a good 5 times every year! I also love the Holiday! That's a film that my twin sister and I watch every single year together and because she's been away in New York all year, this is definitely something I'll be doing with her this year when we're reunited! I also love to watch Love Actually at Christmas time! All time fave! Do you know what.. I genuinely think we did have a white Christmas a couple of years back! I remember waking up and it snowing and then when we walked to Church in the morning it was full on magical snow! My all time favourites are Mariah Carey's All I Want For Christmas & The Pogues Fairytale of New York! They make me feel so Christmassy! On Christmas Eve we sometimes get to choose one present each to open on Christmas eve! It's usually a present from a family member like our cousins or aunty/uncle etc. 5. Can you name all of Santa's reindeer? Dasher, Dancer, Prancer, Comet, Vixin, Donner, Rudolph, Cupid... There's one missing and I can't remember for the life of me who it is!!! I think I've done pretty well though! 6. What holiday tradition are you looking forward to most this year? I just can't wait to go home and spend time with family over the festive season. 7. Is your Christmas tree real or fake? Real! We have always bought real trees for our house :) But we do have a fake one at our Uni flat too this year! 8. What is your all time favourite holiday food/sweet treat? My Nana's chocolate Christmas cake or the Christmas turkey!!! 9. Do you like receiving gifts or giving gifts better? Every single year I receive amazing presents but my favourite would probably have to be my laptop the year I got that! For me though, I prefer all the little sentimental gifts from my family! 11. What would be your dream place to visit for the holiday season? I have always wanted to go to New York at Christmas. I am SO jealous of my twin getting to experience New York at Christmas and I definitely want to experience it one year. I really want to ice skate by the huge Christmas tree! 12. Are you a pro- present wrapper, or do you fail miserable? YES! This is going to sound so sad, but I LOVE wrapping Christmas presents! I'd like to think that I'm pretty good at wrapping presents and I love choosing my wrapping paper theme each year and making them look all pretty! Can you tell I'm the creative type? 13. Most memorable holiday moment? Just spending time as a whole family with my Nana and Grandad eating, drinking and being merry! 14. Do you make New Years resolutions? Do you stick to them? I always make a list but sticking to them is a different question!!! Put it this way, I normally put on that list "loosing weight" and it normally never ever happens!! For me, it's all about spending time with my family and making memories!! Well, there you have it! That's my answers to the Christmas Tag! 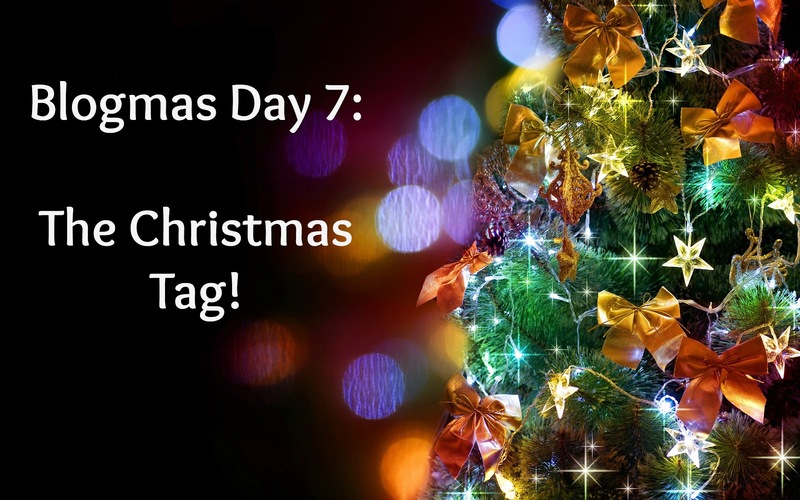 I hope you enjoyed this post, and look out for more Christmas posts during Blogmas! !